"Plugging directly into my amp and letting it crank was a visceral experience, and made me a convert." UNMATCHED SOUND QUALITY & DURABILITY • Silktone cables use oxygen free 20 AWG dual conductors with a braided shield and the highest quality G&H solid copper core 1/4" connectors. Adhesive lined heat shrink is used under the connectors to provide maximum strain relief ensuring reliability and long life. The sound quality is amazing, you will get deep tight bass notes, creamy warm mids and shimmery airy highs. You truly get out what you put in. DESIGNED & BUILT BY HAND IN CALIFORNIA • Most guitar cables are built exactly the same and will not sound any different. The silktone cable was designed differently to unleash the sound a guitar can put out. Using dual isolated conductors allows the guitar signal to travel freely, unimpeded by shield noise. This, along with using a solid core signal conductor, preserves your guitar's complex tone and clarity. ​SOLID CORE SIGNAL WIRE WITH LOW CAPACITANCE AND LOW NOISE • At only 38pF / ft capacitance all of your signal gets through. This cable has an unmatched immediacy and feel - the sound jumps right out of your amp. Using solid core signal wire and isolated return wire gives your sound increased clarity, note articulation, sound separation, depth, presence and amazing dynamics. Chords become clearer and every note stands out. Distortion becomes beautifully layered and textured. DUAL CONDUCTOR SEMI-BALANCED DESIGN • If you play guitar you really haven't heard your tone until you've used a dual conductor (semi-balanced) cable. This is essential for tonal clarity. The silktone cable - using both solid and stranded conductors - provides an incredible balance of sound quality and flexibility. Normally, in typical single conductor cables, the return path rides on the cable's shield causing muddiness and a compressed lifeless sound by comparison - by using high quality dual copper conductors the silktone cable isolates the return and signal path from the shield to greatly boost tonal clarity and depth. The shield is terminated on only one side of the cable (marked by the silktone logo) and this end should be treated as the output for best results (connected toward your amplifer). G&H BigFoot 1/4" CONNECTORS • The silktone cable features G&H bigfoot 1/4" TS connectors on both ends (high clarity version on straight plugs). These connectors use a copper core from solder point to tip and use nylon insulation - it really helps preserve the clarity and depth of sound. They also look cool. Hear your tone for the first time! If you play guitar you really haven't heard your tone until you've used a dual conductor cable. 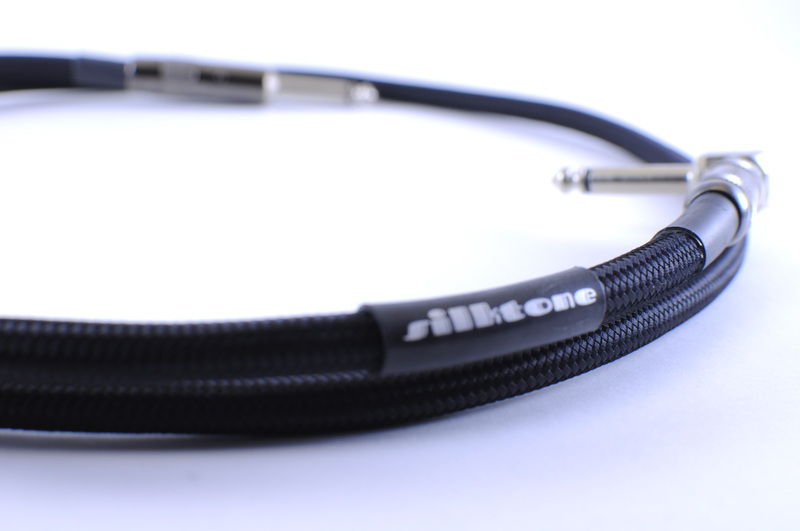 ​The silktone cable was designed to preserve the fast, dynamic, wide open sound a guitar is able to put out. Zero Risk Purchase - Try it out to hear for yourself. You can return within 14 days for full money back – no questions asked.